Jordan Hamilton makes a dribble move. The status of the sophomore guard is uncertain for Thursday’s game against Minnesota. Despite a similar lineup of players, Northwestern seems like a new team this season. At the same time last year, the Wildcats had already lost to Minnesota by a 27-point margin, which started the Big Ten season on a sour note. In 2019, NU (13-7, 6-3 Big Ten) has shown their ability to convert down the stretch of close games, and as a result the Cats head into Thursday’s game against the Golden Gophers (13-7, 2-7) with more Big Ten wins than they had a season ago. 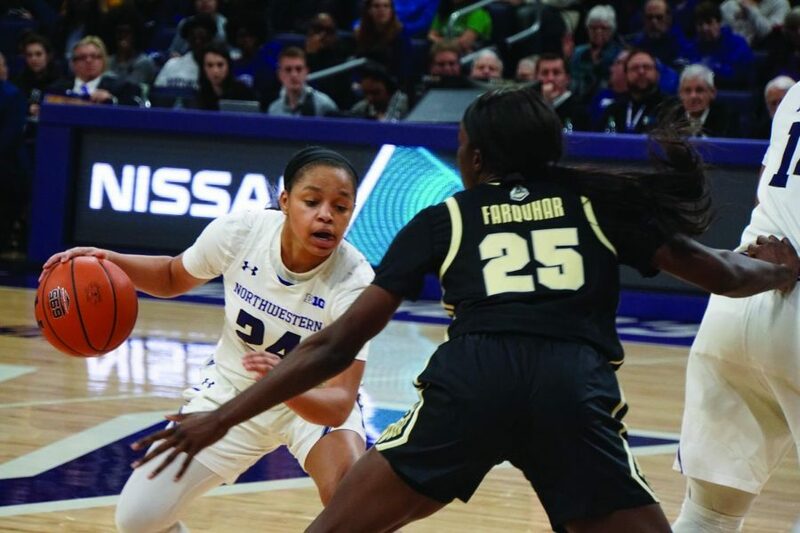 Even in the absence of sophomore forward Abi Scheid and sophomore guard Jordan Hamilton, NU earned its fourth conference win behind an exciting fourth quarter comeback on Sunday. Coach Joe McKeown said NU’s performance was not perfect by any means – they scored just 25 points in the first half – but the Cats altered their approach in the second half of Sunday’s 64-56 win. After a shaky offensive performance in the beginning from typically-aggressive players like sophomore guard Lindsey Pulliam, the team started to give the Fighting Illini limited opportunities to take open shots, and Illinois landed only 5 points in the final quarter. Now holding a 13-7 record along with four consecutive Big Ten wins, NU returns to Welsh-Ryan Arena to face off against the Golden Gophers on Thursday night in a matchup of teams that boast remarkable rebounders. Minnesota forward Taiye Bello is currently ranked second in the conference for rebounds while NU senior forward Pallas Kunaiyi-Akpanah ranks third. When the teams last met, guards Kenisha Bell and Destiny Pitts recorded double-doubles, allowing the Golden Gophers cruise to a 90-63 win. Bell scored on three straight possessions in the third quarter last game, forcing an early timeout on Northwestern’s end. The final quarter sealed the loss for the Cats as Minnesota almost doubled its score, 21-11. Considering NU’s stronger performance in the Big Ten season compared to the last, Thursday will be a major test against a team projected to finish near the top of the conference in the preseason.